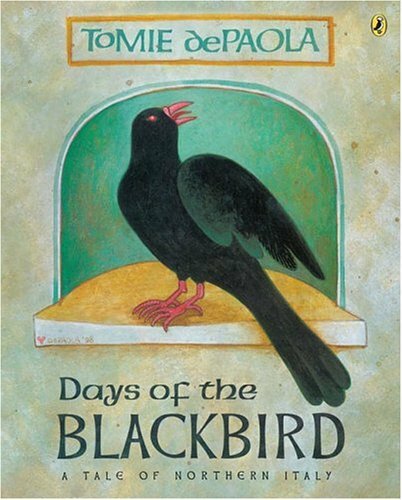 "In this elegant tale, Tomie dePaola imagines how the Days of the Blackbird in northern Italy came to be. Gemma and her father, the Duke of Gennaro, live in a house with a courtyard that fills with birds of all colors through the spring and summer. When the Duke falls ill at the end of summer, Gemma begs the birds to stay to raise his spirits with their song. However, as snow and fierce winds begin to swirl down on the village, the birds must fly south to stay warm, and eventually only one loyal bird remains." Each year during the Days of the Blackbird, January 29, 30, and 31, we feed the birds, cut out and decorate blackbirds* and feel much warmer in general. We think of white birds turning black, trust in the promise of winter ending and spring returning and we watch as our chickadees, who stay here year round, feast at our bird feeder. To find a copy of Days of the Blackbird, click here. How do you get through the coldest, grayest days of winter? Do you have any wonderful stories and/or legends that help you smile on the coldest days? Happy Days of the Blackbird! *To make the Blackbirds we simply trace some of the wonderful illustrations in Tomie's book and use them to cut shapes and create our own blackbirds. i LOVE this. it makes me happy, happier than tea and good books. because really, winter is all about turning in, and then celebrating life. You're not going to like this. I don't. The best way to truly get through the winter is to go outside. All you really want to do is sit by the fire and read books when the view outside the window convinces you to do so, but once outside, everything is so different. A barren landscape from the window comes alive.